There are few grossly visible features of drowning. A frothy fluid may exude from mouth and nose. Prolonged immersion may produce skin wrinkling. 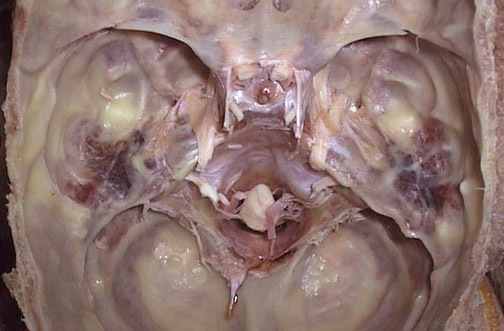 Seen here are bilateral petrous ridge of temporal bone hemorrhages that may occur in association with drowning. Drowning is defined as respiratory impairment from submersion in a liquid medium. This may range from submersion of the entire body to just submersion of the pharynx.